Neveen Shlayan joined the Electrical Engineering department at the Cooper Union in September 2016. Dr. Shlayan was an Assistant Professor at the State University of New York, Maritime until August 2016 where she taught power electronics and electric drives. During her tenure at SUNY, she succeeded in securing funding for multiple research projects in Intelligent Transportation Systems and Structural Health Monitoring for Offshore Structures from UTRC and American Bureau of Shipping, respectively. 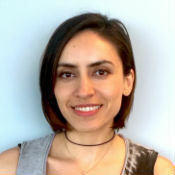 Previously, she worked at Philips Research North-America where she focused on developing mathematical models and applying parameter estimation techniques for large-scale lighting control of transportation systems and smart buildings. Prior to that, she was a research fellow at the Singapore-MIT Alliance for Research and Technology working on mesoscopic traffic simulations. In 2011, she obtained her Ph.D. degree in Electrical Engineering from the University of Nevada, Las Vegas conducting research in Cyber Physical Systems. She also holds a Master’s degree in Mathematics with a thesis in reconstruction of neutron density distributions.